As weight-bearing joints, your hips and knees are especially vulnerable to injury and arthritis, as well as "wear and tear" associated with aging. Osteoarthritis is the most common type of arthritis and typically develops as people grow older. It erodes the protective cartilage that covers your joints and allows the bones to glide smoothly during motion. When this happens, the bones rub together, causing friction and pain. When non-surgical treatments no longer help to relieve your pain, you may need surgery. 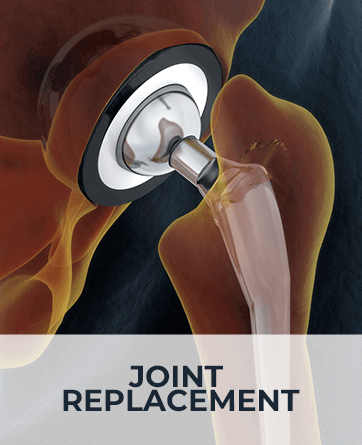 Joint replacement surgery, also called arthroplasty, involves removing the damaged portion of the hip or knee and replacing it with an artificial joint that allows for pain-free movement. Learn more about total hip replacement, total knee replacement, minimally-invasive hip replacement and minimally-invasive knee replacement. ASI (Anterior Supine Intermuscular) hip replacement/direct anterior hip replacement: This minimally-invasive technique allows Dr. Leith to access the hip joint without having to cut through muscles and tendons. By making an incision at the front of the hip rather than the side or back of the hip, Dr. Leith can reach the hip joint by going between the muscles that surround it. By preserving the muscles and tendons of the hip joint, patients tend to have shorter hospital stays and recover much more quickly. In fact, most patients can even walk the day of surgery, experience less pain after surgery, and return to their daily activities more quickly. MRI-based customized knee replacement: In a conventional total or minimally-invasive knee replacement, surgeons typically depend on planning the knee replacement during the course of surgery. However, Dr. Leith uses an MRI of the affected knee to plan a knee replacement prior to surgery. This allows for more patient customization of the procedure. Being able to plan a patient’s surgery in advance with an MRI-based customized knee replacement simplifies the surgical procedure. Surgery is usually shorter and less invasive with fewer complications and more accurate positioning of the joint implant. Hip and knee revision surgery is performed to remove a previously implanted artificial joint and replace it with a new one. Joint revision surgery may be necessary for a number of reasons. The artificial joint may loosen, an infection may develop in the joint, one of the bones around the joint may be fractured, or part of the implant may break or wear down. At River Cities Bone and Joint Centre, our goal is the maximum recovery of your hip or knee function with diligent follow-up care after surgery to get you back to the activities you enjoy. Don’t let hip or knee pain hold you back from what you love to do! Call River Cities Bone and Joint Centre at (606) 324-0097 to learn more about joint replacement and joint revision surgery. We provide orthopedic services to the residents of the surrounding Tri-State area.